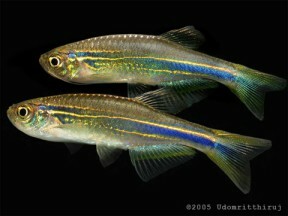 ...whereas females are predominantly blue. Collected from the Tanintharyi River drainage, a tributary of the Tenasserim River system in Tanintharyi (formerly Tenasserim) Division, southern Myanmar. No details are available but expect it to inhabit quieter, slower-moving sections of streams and minor rivers. Probably preys on insects and their larvae in nature. In the aquarium it’s largely an unfussy feeder and will accept most foods. A good quality dried product or two can be used as the staple diet but this should be supplemented with regular meals of small live and frozen fare such as bloodworm, Daphnia, Artemia, etc. 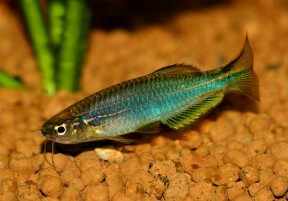 for the fish to show the best colouration and conditioning. 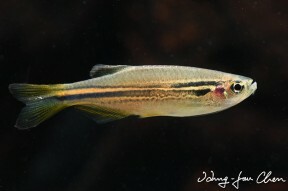 Since it places no special demands in terms of water chemistry it can be combined with many of the most popular fish in the hobby including other small cyprinids as well as tetras, livebearers, rainbowfishes, anabantoids, catfishes and loaches, though its adult size must be taken into consideration. 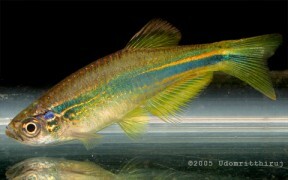 Males have an overall yellowish-green body colour which extends into the fins whereas females are predominantly blue. The water should be of slightly acidic to neutral pH with a temperature towards the upper end of the range suggested above. An internal power filter can be added initially and this should be positioned so that the flow is directed down the full length of the tank. Several spawning events will probably occur before a female is spent of eggs. This probable undescribed species first became available to aquarists in 2002, with males and females marketed as ‘Danio sp. hikari yellow’ and ‘D. sp. hikari blue’, respectively. Subsequent DNA testing in the United States revealed them to be the same species and genetically distinct from the very similar B. kerri. 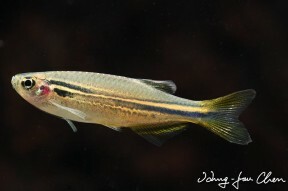 It can be told apart as the central body (P) stripe always extends into the caudal-fin whereas in B. kerri it terminates at the caudal peduncle. Only a single population of B. kerri was sampled in the study meaning this could still turn out to be a particularly colourful form of that species, however.